The better Minecraft Chatting App! PickaxeChat supports adding, saving, and managing multiple Minecraft accounts. Essential for server admins with secondary accounts! Made with best-practices in mind to reduce battery usage so you don't drain your battery when you're on the go. PickaxeChat keeps your account safe by not storing your password. It encrypts and stores your access token instead, just like the vanilla launcher! Easily add, edit, and delete all of your favorite servers. Right on the home screen, you'll be able to see servers, their statuses, MOTD's, and more! PickaxeChat offers a large variety of themes. Pick from pastel, high-contrast, colorblind friendly, classic, and many others. Just like Minecraft on desktop, PickaxeChat allows you to press a button to complete commands, names, and recently typed messages. 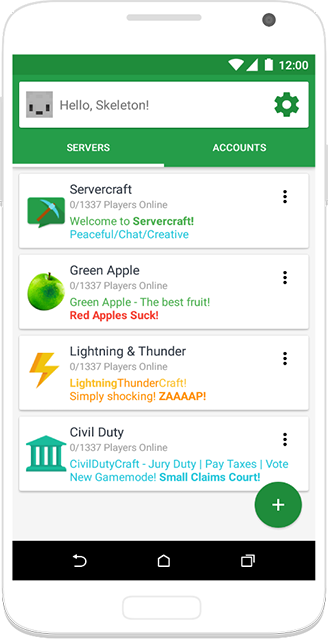 Made by a long-time Minecraft player and server owner, PickaxeChat aims to be the definitive Minecraft chat client for mobile. 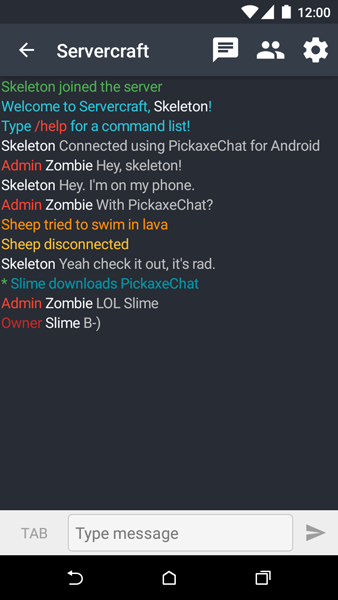 PickaxeChat aims to be the better, cleaner, and more user-friendly Minecraft chatting app. We want to consistently be responsive to feedback and suggestions from the community and maintain a crash-free clutter-less experience.